UPDATED – WASHINGTON (CNS) — An exchange between Catholic high school students and a Native American tribal leader in Washington Jan. 18 was vilified on social media the following day, but the immediate accusations that the students showed racist behavior have been stepped back as more details of the entire situation have emerged. Covington High School, Covington Latin School and Covington’s diocesan offices were closed Jan. 22 due to threats of violence and will reopen when it is safe to do so, according to a diocesan statement reported by the Cincinnati Enquirer. A few dozen people took part in a protest vigil at the diocese’s headquarters Jan. 21 in reaction to the incident in Washington. Robert Rowe, principal of Covington Catholic, sent a letter to parents announcing that school would be canceled Jan. 22 “to ensure the safety of our students, faculty and staff,” the newspaper reported. 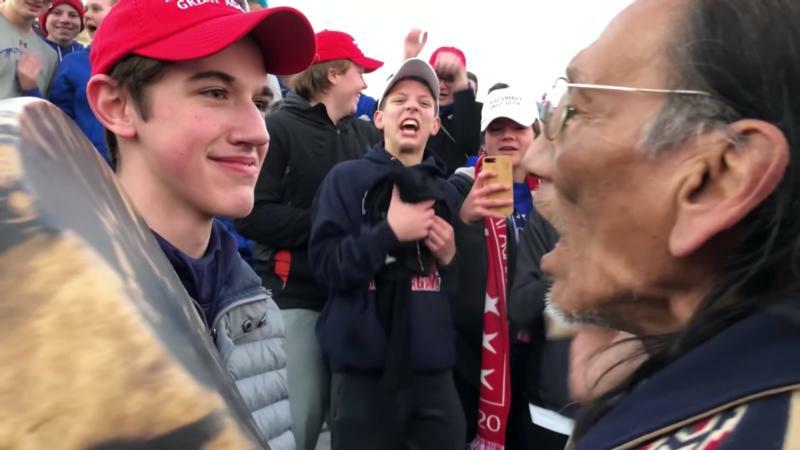 In a statement released Jan. 22, Phillips said he was disappointed that Sandmann “didn’t accept any responsibility.” The tribal leader said he is willing to meet with the Covington Catholic High School students to discuss cultural appropriation, racism, and the importance of listening to and respecting diverse cultures. I believe the statement that the boy made about his principles and it stands out in him. Being “confused” but being able to say that he is a faithful Christian and a practicing Catholic” gave him strength. It appears that he was composed on a spur of a moment meeting. I agree with the chaperone those kids were targeted. They did nothing wrong and are totally inocent. The boys should not been allowed to wear the “make America great again” hats. They were there for pro life not to be political. If we Catholics and the Church want to be political, then the Church should not be exempt from paying taxes. That is why the churches do not pay real estate taxes, because they are not to be political. Where were the adults with these students? Our young people have just gotten a taste of the world that Catholics and other Christians are living in — outrage/ condemnation/ media rush to judgement — all of this on a daily basis without anyone looking at facts. If they are lucky, they get a half-baked apology. Being offended & championing Diversity are more important to some than looking for the “factual basis” of what happened — our courts give defendants the right to know the “factual basis” before they plead guilty, but law abiding citizens get no such protections. The kids are 100 percent innocent.